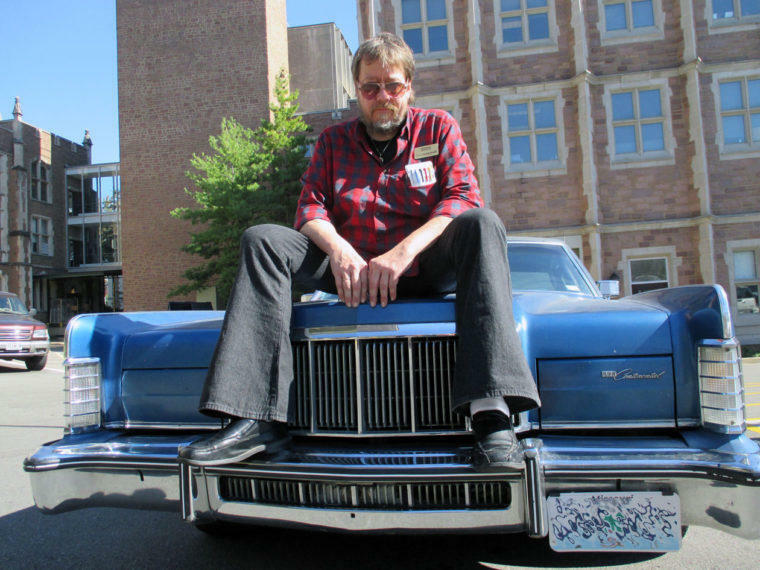 Gerry Rohde sitting on one of his classic cars in a parking lot at Washington University. Note his St. Louis Public Radio nametag on his shirt. St. Louis Public Radio is mourning the loss today of one of our own. Gerry Rohde, our longtime evening host has died. He was 55. His body was discovered this morning in the stockroom at the biology department at Washington University where he worked during the day as stockroom manager and lab safety officer. The cause of death is unknown at this time. Rohde has been part of the St. Louis Public Radio family since 1985 serving first as a host of jazz program. In 1996 he started hosting the evening shift, 7 - 11 p.m., Monday through Friday. Listeners enjoyed hearing him play with words both phonetically and contextually although English was not his first language. Rohde was born in Bremen, Germany, and learned English by listening to the American Forces Network on his father’s radio. He studied English and political science at Bremen University and came to St. Louis in 1983 to pursue a degree in German and mathematics at the University of Missouri-St. Louis. In addition to his dedication to both his work at Washington University and St. Louis Public Radio, Rohde was a car enthusiast. He nursed several classic cars from the 1970s and '80s back to health, fixing them up in a garage he added onto his home in Overland. We’ll have a more detailed obituary about Rohde in the coming days. In the meantime, we encourage you to share your memories of Rohde on our Facebook page. Updated May 11 with St. Louis on the Air conversation in remembrance of Rohde. Orginial story published May 9. Gerry Rohde’s voice has been familiar to St. Louis Public Radio listeners for more than 30 years. He died this week of an unknown cause. Geralf “Gerry” Rohde was born in Bremen, Germany, in 1962. He grew up with his older sister, Geena Eaton, who shared his love for country music, especially Waylon Jennings. According to Eaton, Rohde loved the English language and spent a year in St. Louis as an exchange student in 1978 at Bayless High School.